Amazon released a new Kindle advertisement today which takes a direct punch at some of the shortcomings of the iPad. Aired on Good Morning America, the ad highlights how the Kindle scores big time over the popular Apple tablet when it comes to pricing and screen display. The new Kindle is now available for $ 139 and features the new e-ink screen which makes for crystal clear display in direct sunlight. The ad clearly shows a man finding it impossible to see and read what’s on his iPad’s screen while sitting on the beach. The woman next to him is shown holding a Kindle which has a perfectly clear display in the same glaring sunlight. The ad makes use of two very valid points as even with all its features, the iPad is still a pretty expensive device and if its screen is unreadable in the sun, it beats the purpose of a mobile device. The Kindle may not be coloured and without a huge number of applications but it’s easy to guess which one of the devices an average user is more likely to spend on considering the above two important qualities. The new Kindle is already doing great for itself as it has become the fastest selling Kindle ever. Amazon has successfully hit the iPad where it hurts the most and we’re sure to see some debate and comments on this new rivalry. It would be interesting to see Apple’s response and more importantly whether they’ll now get down to improving the iPad’s sunlight display problem so the next generation iPads can come out with more dignity. You can watch the ad below and judge for yourself. The advertisement is very humorous, of course, but actually iPad and Kindle are very different devices by their functionality, so they shouldn't be compared like that. 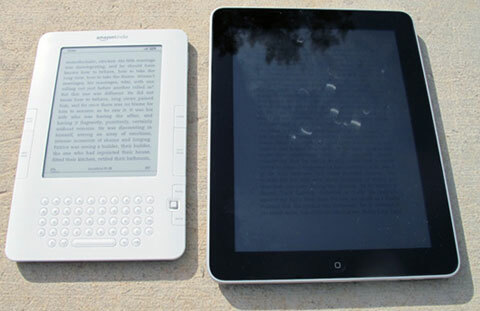 Kindle is just an e-reader, while iPad is a multifunctional gadget, so it's natural that Kindle provides better reading experience, while its cost is still lower.